Everyone Makes Mistakes. It’s a normal part of learning and growing. Here Are The 9 Biggest Website Mistakes (And How to Fix ‘Em). Most CEOs just want results. And they’re disappointed when they don’t get them. But I find it curious when they complain, and then they don’t go anything to fix the problem. Sometime’s they’re just not serious about using their website to produce results. The good news is… each of these problems is easy enough to fix. Here are the nine biggest website mistakes I hear from small business owners and how I fix them. You don’t get a second chance to make a first impression. And on the Internet, you’re “a click away from oblivion.” Fair or not, if your website doesn’t reflect your company image, you’re only hurting yourself. Tsk, tsk. For shame. I create a responsive website that matches your brand colors & overall company feel. Since it’s responsive it works on PCs, Laptops, Tablets, and Smartphones. I have developed what I call the “The 7 Creative Essentials Of A Website That Works”. You don’t just want your website to convey your company image, you want it to pass the “Coffee Shop Test”. That’s where you ask a complete stranger can look at your website for 5 seconds, and tell you what you do. If they can’t tell you, you need to continue to work on your website until you pass. The Small Business Owner's Guide To Create "Marketing That Matters"
A step-by-step guide to create a brand that stands out, and create marketing that's like a conversation. A conversation your customers really care about. Usually this means you’re not getting enough of the right type of traffic. Web traffic can come from organic keyword search (SEO) or paid advertising (PPC); as a result of links shared in social media, or paid efforts via sponsored posts. I aim for quality over quantity, and try to do a little bit of everything. I start by targeting a specific keyphrase for which there’s not a great deal of competition. When you’re starting out, it’s best to be a big fish in a small pond (or a big fish in a bunch of small ponds). It’s important to monitor your analytics to see what’s working and what’s not working. If you retargeting/remarketing to the mix, you can start to see results pretty quickly. One of the biggest complaints about small business websites is that they don’t make the telephone ring. If you’ve got a responsive website, it’s very easy to add your phone number to the upper right hand corner of your website, with mobile optimized text that makes it easy to dial on smart phones. Chances are 1 out of 2 that someone hitting your website on a targeted search is on a mobile device, so we make sure your phone number’s easy to find, to make it easy for your prospects to call you. If you want to measure it, you can add a “Click to Call” number by a service like Twilio. When I hear this, I know there are things we can do to fix it. Not all leads are created equal. Some prospects might have an urgent need and are looking to engage promptly. Others might be talking to other companies just like yours. Still might be evaluating options for a future need. Your website should be set up with clear objectives and be built to convert. You should have two offers on your home page. One for the prospects who have an immediate need. And a second offer for those who are still looking for a solution to their problem. Typically I’ll create an offer around: “Have someone contact me.” And another lead magnet that promises to solve a big problem, to attract prospects. We send them a series of emails “a drip marketing sequence” to educate them about that you do. The idea’s to establish a relationship, and overwhelm them with information about how you provide value. Eventually, they’ll get tired of living with their problem, and contact you. When I hear this complaint this means that the website doesn’t follow basic convention or usability, or no-one bothered to define the objectives for the website. The website’s lost in space. Your website’s an extension of you and your company. Like your business, it should have a purpose or an objective. Set objectives for the site. Map out the functions of the website, and how your prospects and customers will interact with the site. While this complaint is very common, it usually means the business owner’s given up on making the website work. It’s really one of Seth Godin’s variations on stupid. I build all my websites using WordPress and the Genesis Framework. If you can operate Microsoft Word, you can operate WordPress. It’s extensible via plugins. And there’s a huge community that uses it. So if you want to add functionality to your website, chances there’s a plugin for that. This is not really a valid complaint, and another of Seth Godin’s variations on stupid. If you want all your products and services on your website, just do it. You can gain a huge SEO benefit by adding all your products and services to a shopping cart. I use Woocommerce and WP All Import to import .csv files that you can obtain from your manufacturer. This is not really a valid complaint either, and another of Seth Godin’s variations on stupid. A tool is only as good as the person using it. Set SMART Goals. SMART goals are: Specific, Measurable, Attainable, Realistic, and Time Bound. There are three things I do to get a small business started: (1) Set up Google Analytics (2) Target a very specific keyphrase for the website, and (3) Define a goal for the website (generate leads & new subscribers). If you’re unable to get timely support from your service provider. It’s time to find another service provider. Responsive is my middle name. I’d be happy to help. So those are the 9 Biggest Website Mistakes and how to fix them. Did I miss any? 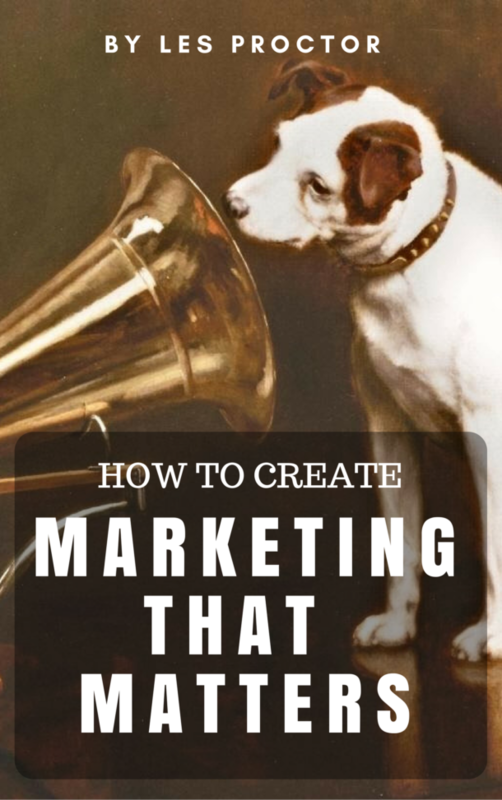 A step-by-step guide to create a brand that stands out, and produce marketing that's like a conversation. A conversation your customers really care about.